FAMOS robotic® is the result of long lasting and continuous developing in close collaboration with our robot programmers, constructing engineers, partners, the robot manufacturers and, especially important, our customer. All our developers have practical experiences with real robots in real plants. The result of this collaboration is an applicable off-line programming system for robot programmers. Whether during the preparation in the office or the optimization directly at the cell FAMOS robotic® is the efficient tool to generate trajectories and to optimize your process! 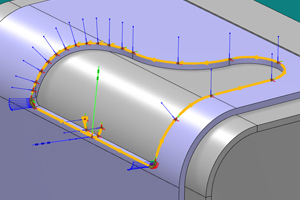 CAD-models can be imported in different formats and used easily for the generation of trajectories. Paths can be made for example along continuous curves and edges, on surfaces and intersections. 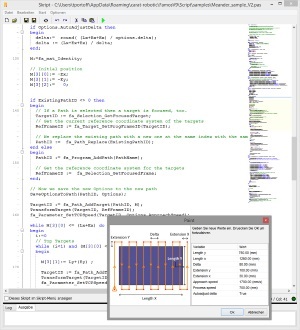 The powerful and easy configurable collision detection can be used not only during the simulation, but it also helps optimizing the programs. 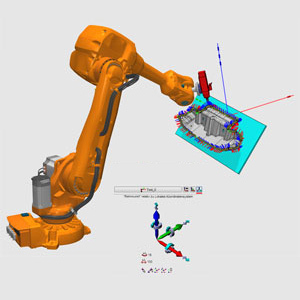 All coordinate systems as robot targets, tools or bases can be moved and turned relatively to every other coordinate system in the project. The values can be changed incrementally or entered directly. 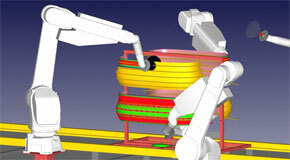 Orientations are showen automatically in the format of the respective robot. Optional also in one of 23 Euler formats or as Quaternion. 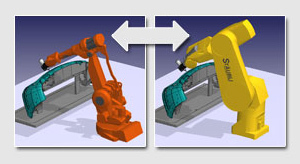 Several robot, also of different manufacturers, can be used in the same simulation project. 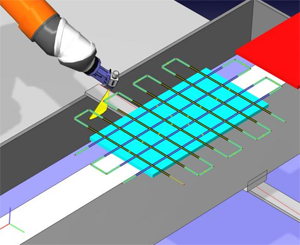 The number of the robots in a project is limited only by the computer performance. Every program position can be selected by the mouse cursor in the graphic window. All parameters are immediately available at every individual point. Thus it is clear with which speed the robot is supposed to move at that robot target. Parameter values can be changed in the same quick way. Simply entering a new value and confirming. Parameter values can be highlighted along the trajectory for example GUN On/ Off signals of coat or spray applications. You can change the program language during the runtime. 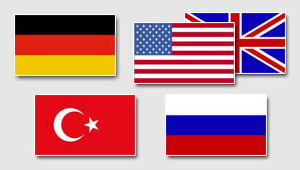 Actually the languages German, English, Turkey and Russian are supported. Scripts allow you to create your own functions, which you can create yourself and adapt to your specific needs. You can use scripts to automate tasks that keep repeating themselves. Move and rotate path points, duplicate or generate new paths. Realize, for example, approach movements that are optimally adapted to your process and your tools. Assign certain parameter values to certain path points. Import path points from a self-created text file or export the path points in your own format. Paste Famos data into the clipboard for use in other applications. Query parameters for their function in a dialog. Pascal is used as programming language. There are no limits to your creativity and inventiveness.